Cougar Count… 28 in the wild! While she sleeps peacefully on the couch, drenched in the afternoon light warming the house, I look beyond the rays of streaming sunlight, out the western-facing windows to the snow-covered mountains that rise just beyond our town’s edge. I am reading the recently published book, Path of the Puma, by Jim Williams. This book documents past and present cougar research from the Northern Rockies in British Columbia to the pampas grassland steppe of Patagonia. It’s a great read if you are interested in learning more about the illusive carnivore that is known by many different names. Around here, we refer to them as the “Ghost of the Rockies”, or the mountain lion or cougar. 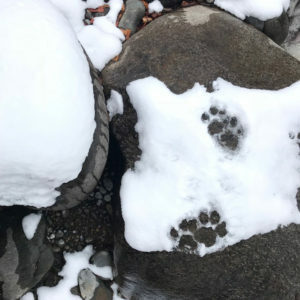 As many people will tell you, this animal has escaped many an keen photographer, wildlife-researcher or general Yellowstone National Park visitor. Now 38 years later, I find myself contemplating my current relationship with this amazing creature. At the age of 44, as I start to gray around my edges, I try to keep young in mind and soul by being physically active in this Greater Yellowstone Ecosystem. A place that I so fortunately can call “my backyard” (and literally, my “front yard” as well). Nestled between two large tracts of Public Land, the little town of Gardiner, Montana is where I call home. 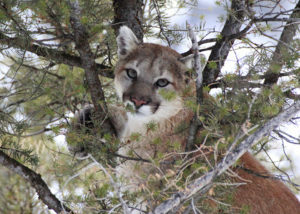 A well known biologist in the world of cougar research, Toni Ruth, was once quoted in an article in Outside magazine where she said, “My favorite thing is simply being out in lion country, tracking a cat, thinking that around the bend I could find a kill or knowing that a cat may be watching me. I find great comfort in this.” Upon reading that quote, I couldn’t agree more with her. I love going beyond the first ridge, off the beaten path and down the drainage in the dark timber to a place that might hold some interesting sign of predator and prey interaction. 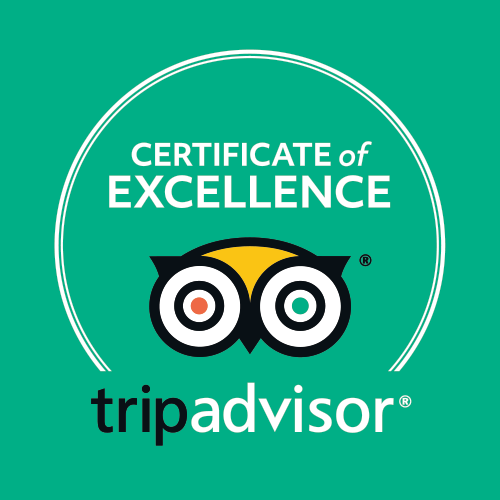 These off-trail excursions have opened a door to me that I continue to walk through. Each winter once the snow starts to fly, we here in Montana all know that there is a long season ahead. I jokingly have referred to our calendar year as nine months of winter and three months of visitors. When the white flakes start to accumulate and the big bruins (grizzlies) have gone to their slumbering state, that is when I love to walk the mountains in quiet solitude. Over these many miles and countless excursions I have been fortunate to have watched 28 cougars in the wild. There could be an overlap with a kitten from one sighting that became an adult sighting years later, but that’s not how I count the tally. Each experience and sighting is unique and memorable as a single moment in wildness. 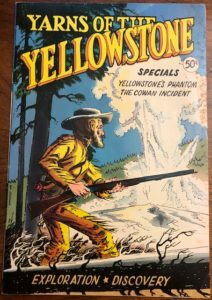 The cougar sightings all started way back when I was working as a Resident Instructor for what was then called, the Yellowstone Association Institute. One of my winter jobs was to lead multi-day trips throughout the park with different locations seen each day. On one of the Northern Range days we had planned to ski the 5-mile trip towards Tower Waterfall from Roosevelt Junction. After the ski, as we drove past Hellroaring Overlook in the afternoon, the parking area was overflowing! A family of 5 mountain lions were being seen about 1-2 miles away on a cow elk carcass. It was thought that it was a mother with 3 young and another older cat was in the mix as well. Maybe an older offspring from the mother that she was still tolerating around…. So my first wild cougar sighting was the jackpot of 5 at one time! 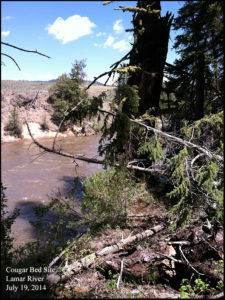 (please refer to my blog post titled A RARE OBSERVATION INTO THE WILD – COUGAR & WOLF for more information). 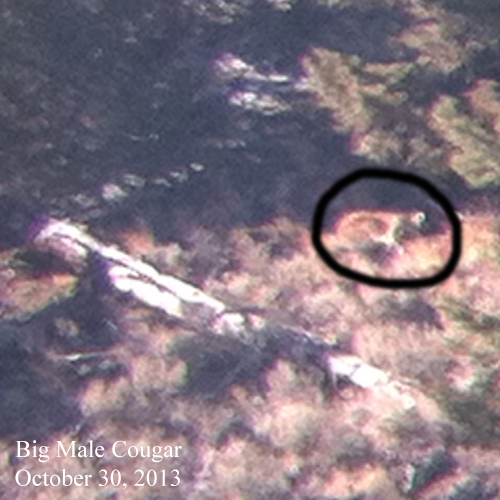 The cougar sighting list continues after being introduced to a gentleman who uses hounds to track mountain lions. The main way to tree a cougar for study or for hunting of the animal is to use dogs. These dogs need to maintain their training and knowledge base even when not for hunting or research, so during the winter tracking season his dogs can chase cougars legally even if the end result is not a cougar being killed or collared. This was a moral dilemma for me, as I didn’t like the idea of putting stress on a cat just to see it up close, but I tried justifying it to myself by realizing that the cat wouldn’t be killed, but hopefully more wary of barking dogs, road crossings and of course, humans. 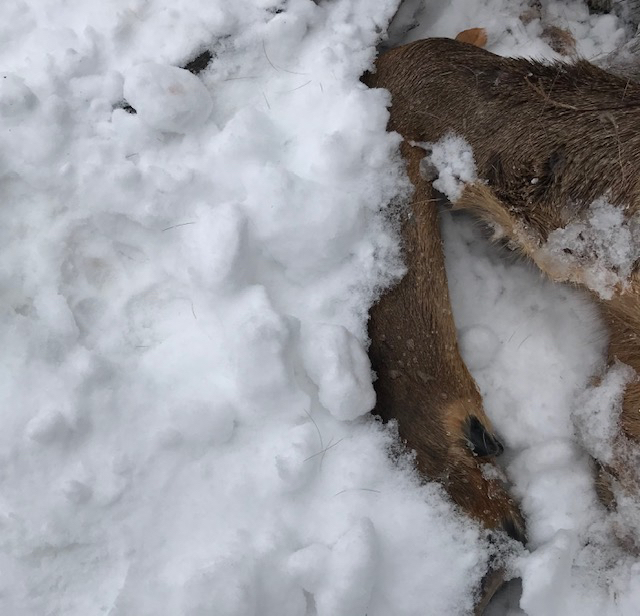 I justified my experience that he was taking his dogs on the track of a cat whether I was with him or not and that the cougar would live to see another day. 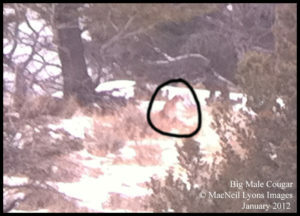 With that said, the next two sightings are the only two on my list made possible by using dogs to track a mountain lion. These two sighting don’t need much detail other than to say, they were eye opening for me as to how a cougar uses the landscape. Up and down, through one deep drainage, crossing another ridge line…Using the cover of vegetation and steep angles to quickly elude the pursuers. One cat was estimated to be a female of about a 100 pounds. The other was a young cougar that took to a tree for a bit, but eventually made it to the secluded cover of a boulder field where it nestled deep under a massive granite rock. The next opportunity was another family group, but this time a mother with two young. During a September archery hunt that was focused on Rocky Mountain elk, my hunting partner and I worked our way towards a herd. We were 9 miles up a dirt road and about a mile walk into the timber. With plenty of recent elk sign, he set up about 15 yards behind me to use some vocal calls in hopes of enticing an elk towards me. A bit of time passed in the quiet woods, when a twig snapped over the rolling hill in front of me. I was on heightened alert with all senses tuned into what might be there…. A bull elk? A cow elk? What might it be? Out of the right side of my view a flash of brown streaked past. It was the color of a deer, but made no noise. Immediately after, in the same place the first animal disappeared, two others creatures came into view and headed directly my way. Walking low in a stalking mode, vocalizing to each other, were two young cougars coming in direct with intent! I stood up and called to my friend, “Joe, cats!! 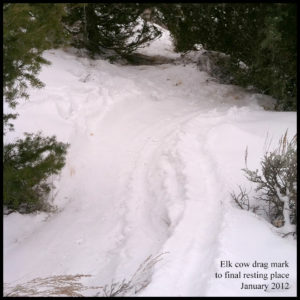 !” He responded from his hidden spot with a slightly whispered, “what?”…. I pointed and said loudly, “COUGARS!” He saw what I was pointing towards and the two cats stopped dead in their tracks. Looked around briefly and retreated from where they came. In seconds, the two faded into the underbrush just as their mother had. We recognized that we had called the cougars in, as they thought we were a solitary cow elk or calf…. They were hunting, as were we, but both as surprised to see one another. 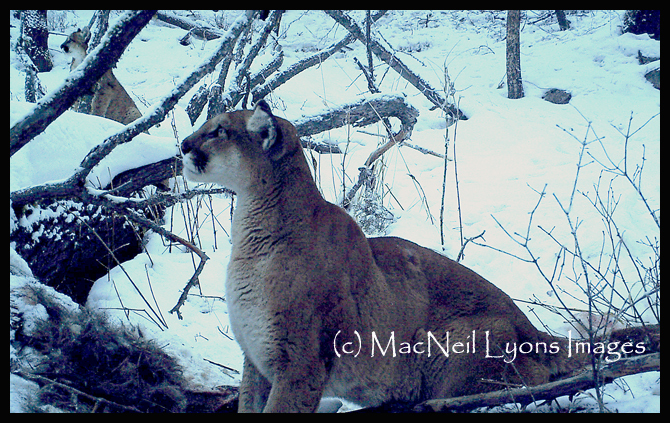 I checked my range finder to see that the young cougars had been less than 30 yards from me and coming in fast…. The next three were very young kittens, still with blue eyes and noticeable spotted coats. It was winter, maybe February. The daylight is not long at this time of year and as the high plains desert of Gardiner was amidst the muddy season, after a day of guiding I took my dog for a walk above the snow line to lessen the amount of dirt she acquired. I had in mind an open grassy bowl to gain elevation quickly and get some needed exercise for us both. 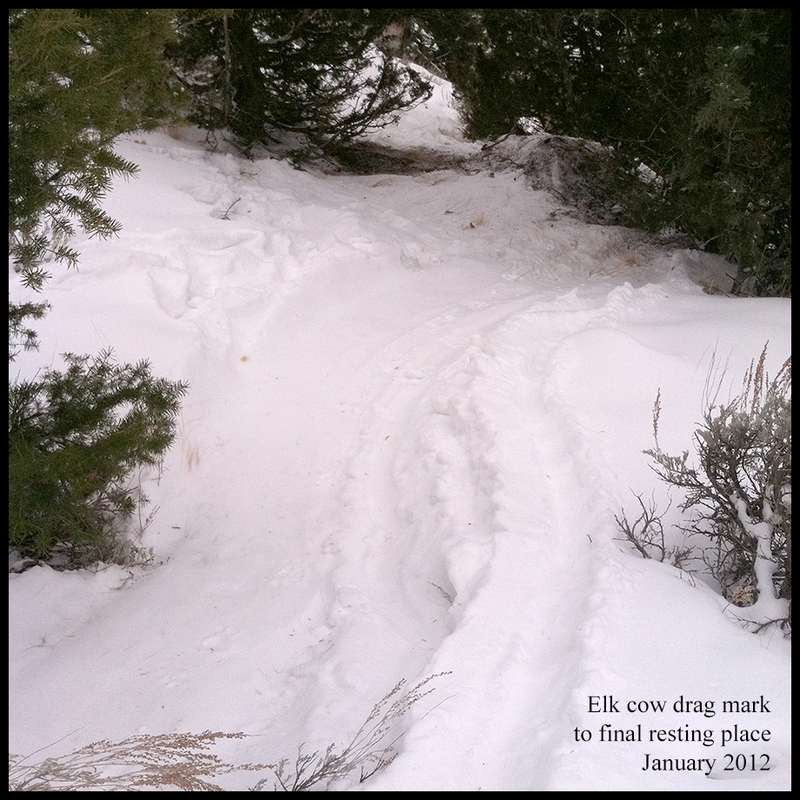 Upon our arrival, the place was loaded with elk and deer, some bedded and others grazing. I chose to conceal us in the timber to still get our exercise and not disturb the animals. The wind was howling from the open grassy meadows towards us, so being downwind, I knew we wouldn’t bump the herds…. Half way up the slope some snow cornice had fallen off the top of a rock outcropping. My curiosity got the better of me as I wondered if an animal had taken a missed step and fallen over the edge. As I peered over the ridge with intense winds behind me I saw to my disbelief three young mountain lion kittens…. They were vocalizing high pitched cries as they meandered aimlessly below me. I quickly backed up and called my dog Sadie who does amazingly great off-leash (doesn’t chase animals). She was unaware of the cats below us and was sniffing intently the snow around us. I clipped on her leash and we backed down the way we came up. To this day, I have no idea where the mother cougar was. Was she stalking the elk and deer opportunities just above us? She wouldn’t have heard or smelled us walking down below in that wind. The sighting was brief, but oh so memorable. A couple years passed until my next wild cougar sighting. 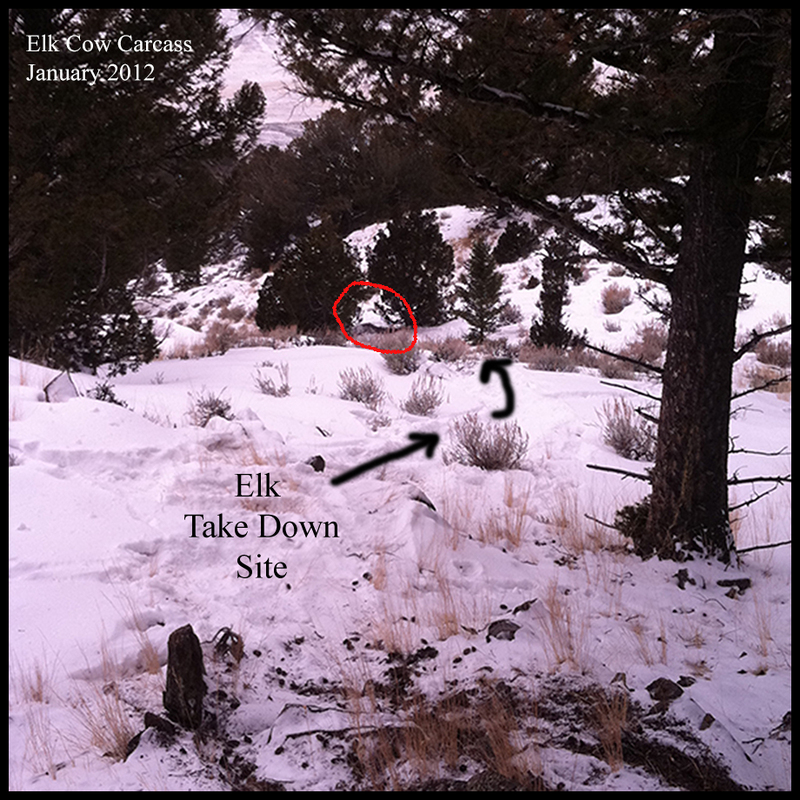 In late October of 2013 during the mid-day doldrums of a back-country rifle hunt in search of elk, my hunting partner and I had split up to cover more ground. We had cell service where we were so we were able to keep in touch. I sat back on a sagebrush hill and used my Nikon 8×42 binoculars to focus on the surrounding hillsides in hopes of finding bedded elk…. I found something, but it assuredly wasn’t what I was looking for. 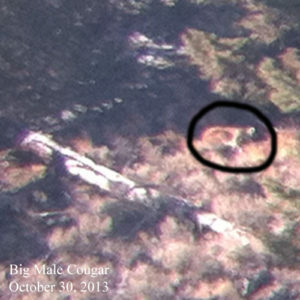 Laying out on a ridge next to a fallen tree was a sleeping cougar… I couldn’t believe my eyes! I texted my friend Matt and we were able to sit and watch this big male stretch, clean himself, re-situate his bedding spot, and spy down upon his surroundings. He eventually stood up and ventured into the drainage of dense timber that separated us from him. 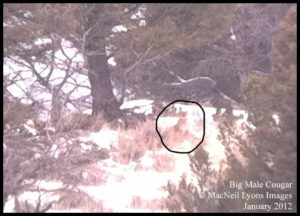 As he disappeared from our view, we thought it best to distance ourselves from this now meandering male mountain lion. As we stood to shoulder our packs and rifles, rocks were being rolled down below us and timber branches were breaking. As we strained to see what was happening, it was unbelievable to watch the big cougar in hot pursuit of one of the biggest bull elk I have seen on public lands beyond Yellowstone National Park. 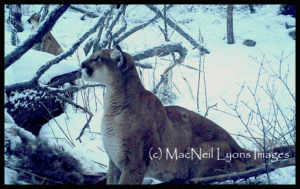 This cougar was chasing a rut-weakened bull up the draw away from us, but in plain view for us to bare witness. The cat eventually gave up the chase and the bull stood for a brief moment looking over his shoulder towards our direction in disbelief. His chest heaving in and out, breathing hard… If he could speak, I bet he would have said, “Did you just see that?? ?” And just like that, he was over the ridge and gone. One summer day while guiding a private wildlife tour for a couple from England, we took a late morning walkabout near Crystal Creek, across the street from the Slough Creek Campground road. They were both veterinarians and visiting Yellowstone for the first time. I told them about a winter-killed bull elk carcass we could check out. They were both interested in the off-trail excursion, so we went… On our return walk we took a different path through a wooded area along the banks of the Lamar River. We were within sight of the road, but the sound of wind in the trees and the rushing waters obscured our voices. I gave out a yell before entering the woods on the off chance we’d bump a bear from its day bed. Well, that didn’t work very well as we walked up and nearly on to a bedded cougar. He/she was just 26 feet away from us laying in a partial sunny and shaded spot next to the river’s edge. The cougar burst away from us, startling us as much as we did it. All you could hear was a twig breaking as the cat leaped over a fallen tree trunk. All three of us were nearly speechless. 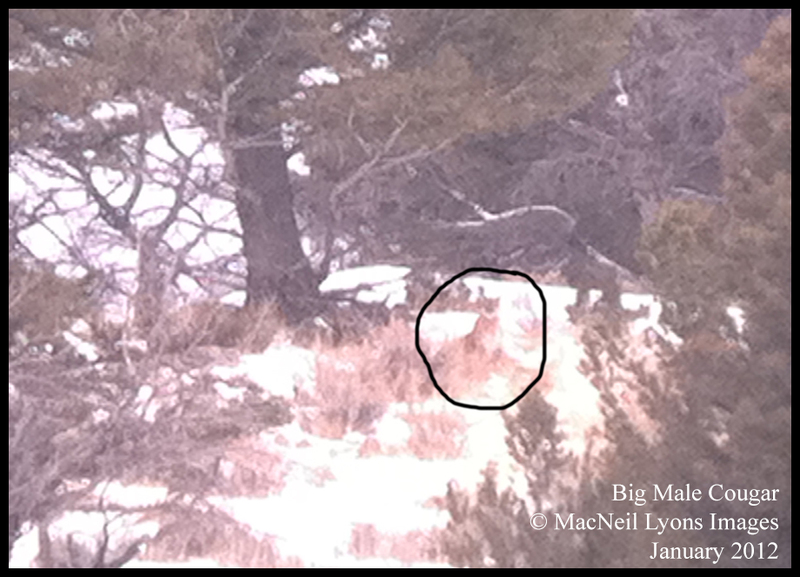 I did get a chance to yell out loud, “cougar, cat….mountain lion!!!!”…. It was again a brief but oh so memorable sighting! 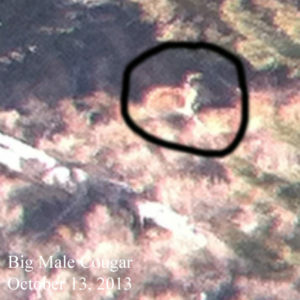 So tallied up, that makes 28 cougar sightings. As I type this blog post, the winds are picking up outside now that darkness has fallen. 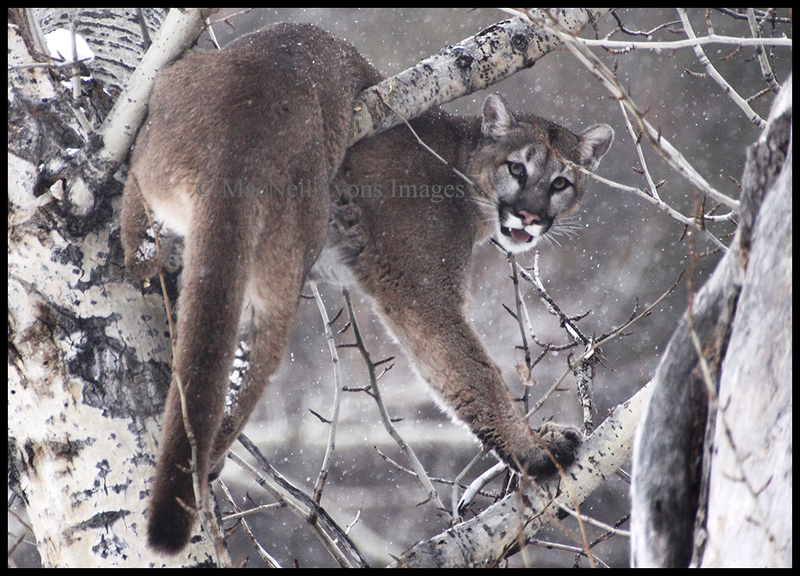 The extended weather looks to bring multiple days of snow to the region… I have high expectations of seeing more mountain lions again this winter season and have vowed to be more diligent about hiking with my Canon camera and telephoto lens. 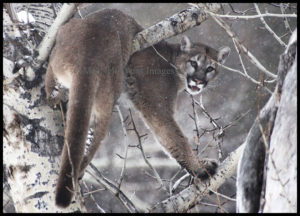 Amazing to read of your cougar sightings. Such an elusive cat but you managed to see many of them.. I chatted with you briefly at the Pebble Creek parking lot this fall after you had seen the Lamars a day or two prior. Thank you Susan… I appreciate you taking a moment to write. I will keep spotting and say hello if our paths cross again! Cheers. February 17 and 18, 2007. I have video and pictures. McNeil, that was an amazing read. I first met you on our Hoodoo trek many years back. Since then, we moved to Livingston, and I always enjoy running into you in the Lamar and at the Film Fest. I usually have to remind you who I am, but I always think of you as the animal magnet. Love your photos. Vicki (and Butch), I remember ya, but the old brain sometimes doesn’t remember names so well… I am glad that you appreciated the read. 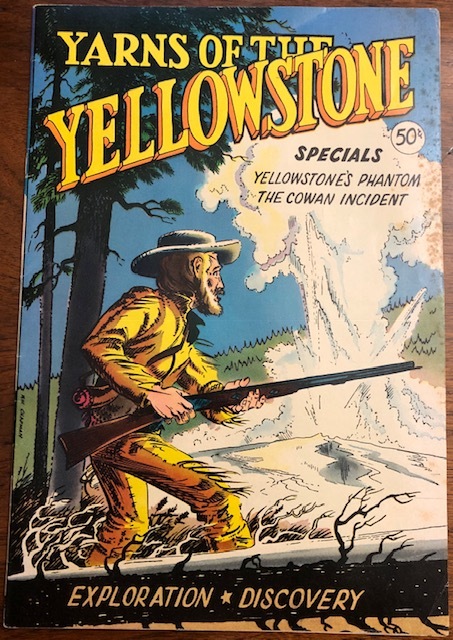 I am glad that you are such a fan of Yellowstone National Park and keep coming back and have moved closer to see its amazing changes throughout the calendar year! Always say “hello” if our paths cross…maybe soon! Until then. Cheers. Riveting tales of cougar sightings! Thoroughly enjoyed the stories and look forward to hearing about what incredible encounters occur this Winter!